Named by the students of the hall for virtuoso rock guitarist, singer and performer Jimi Hendrix, Hendrix Hall opened in 1972. It is primarily an upperclass co-ed, four bedroom suite-style residence hall. It features the independently student-run WNYF television station in the basement along with the laundry facility, as well as a kitchen area in the main lobby. 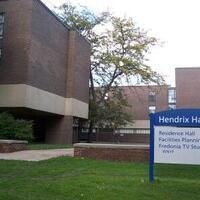 Hendrix Hall is located in Andrews Complex, houses the Office of Facilities Planning in the main lobby and is directly across from the Igoe/Hendrix parking lot. Please note: Hendrix Hall is closed for the 2017-2018 academic year. So You Want to Be a RA?